. . . Omega’s Intro Series Folder Gluers All Include an ERO 3-Gun Glue System with Purchase! Ask Us if You Prefer an HHS, Leary, or Nordson Glue System for Additional! 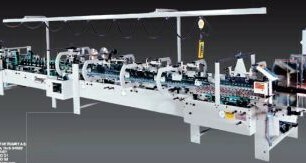 Want to See a Video of Our Omega Intro Series’ (3) Finger Backfold System Producing a 4-Corner Box at 100 Meters/Min.? Click HERE! Or, watch a video of an Intro 80 Straight-line application below (Scroll Down)! Click here to learn more about our Omega Folder/Gluers. Or, contact us for more information on our Omega Intro Folder/Gluer series by clicking the blue “Get More Information” button to the right! Additional information is also available via the product brochure below.